Deep sea sport fishing around Culebra can land Tuna, Sailfish, Kingfish and many a Barracuda. Make sure to share the trophy shot of your catch in Culebra pictures! 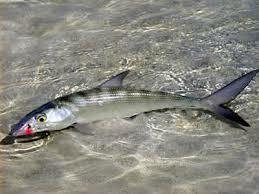 Spear fishing is legal in Puerto Rico. Some reef fish carry ciguatera, a toxin originated from a dinoflagellate and passed up through the food chain. When spear fishing and snorkeling, please observe proper reef etiquette!